Apparently, there are around 4,200 different kinds of religious ideologies in practice across the world. Whether you hold true to a certain faith or not, there’s no denying that blindly diving into something with both feet can easily lead to shallow water. This is the very moral paradigm that Agatha Knife uses to set up its guiltless premise, as it questions such topics with a darkly comedic approach laced within a cute little point-and-click adventure. Agatha is a seven-year-old girl who adores the company of animals. She basks in the presence of them with admiration and care, listening to their tales and earning their trust. The only problem is, Agatha loves her meat even more. So much so, that her actual bedroom is the very abattoir where she murders and chops up her tasty friends to sell at her mother’s butcher shop. 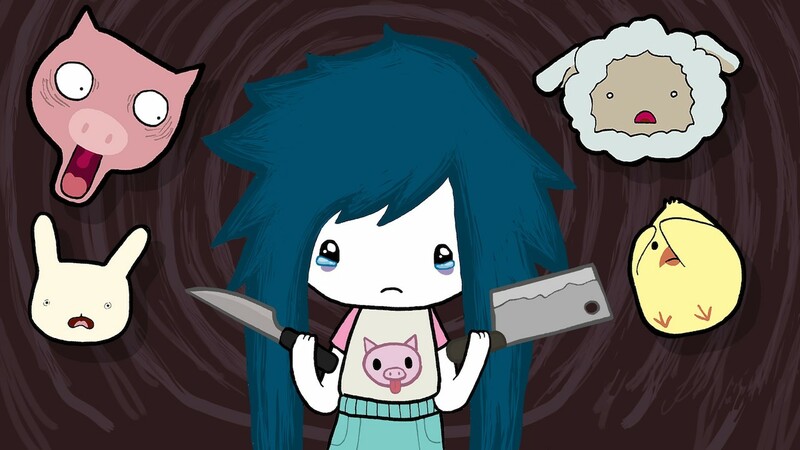 Despite being happy enough to end the life of the animals whom she connects with, Agatha really doesn’t like the fact that the adorable little livestock shudders at the sight of her knives. On top of that, her mother’s butchers have been sinking in debt as of late due to a sudden abandonment of customers. As a result, Agatha learns that maybe the best answer to fix all her problems could very well lie in creating her own religion. So, she seeks the mentorship from the Awesome Sandro to conjure up the faith of carnivorism. Within the first 10 minutes of delving into Agatha’s story, you learn of various quirks that townsfolk endure in order to satisfy their own comforting needs. For example, there’s the elderly couple who worships a timelord with the promise of eternal bliss as long as they buy his special cheese. The transvestite prostitute who’s attending a co-worker’s wedding, and a father, who fed his dead wife’s corpse to his grieving son as a token of closure because he stubbornly believes that her physical body is worthless for it is only her spirit that truly passed on. Of course, it’s the transvestite prostitute who finds the most content in his own sense of well being, despite finding it rather uncomfortable to explain why to a seven-year-old child. As for the story itself, the beginning is as dark and as interesting as the game really gets. The narrative throughout is clever and well written but the shallow story is stretched to breaking point across its half a dozen hours of countless backtracking and fetch quests. There are some traditional point-and-click puzzles to be seen here, although even they are so generic and few in number that you could easily count them all with one hand. Controlling the game can be done simply using the Joy-Con when playing on the TV. However, I found the most convenient way to interact with everything was to undock the Nintendo Switch and solely use the touchscreen controls. When relying on physical controllers, I just found it far more fidgety in comparison. This is especially the case due to how easy it is just to tap the screen for interaction, as opposed to clumsily floating a cursor around with the Right Stick. Minus a couple of detours here and there, most of your time is spent constantly trekking up and down the same street collecting the necessary requirements for your new religion. It all begins to become tedious very quickly as you traipse back and forth rummaging around for items. It’s a shame because I did dig the whole dark satirical sense of humour for the most part, but, unfortunately, even the game’s comedy began to fall flat the further I got into it. There are little nods aplenty that reference popular culture to be seen here though, like One Punch Man, Pingu the penguin, and the annoying trend of Ugandan Knuckles to name a few. There’s also a Stan Lee moment with one of the developers that breaks the fourth wall in a charming little way. The whole art style has a delightful groove that can make a rather grim revelation seamlessly fit within an adorable and cuddly storybook style. This compliments things further by how Agatha herself is a likeable protagonist who’s lack of common knowledge of the world around her enables an innocent yet blunt view of her own observations. When it comes down to it, Agatha Knife takes an interesting topic that is rarely explored within the gaming world. The short, sharp, and witty narrative do provide a certain unapologetic personality that fits very well in this day and age. It’s unfortunate that it all starts to become pretty stale quickly as the game’s repetitive loop of generic point-and-click fetch quests rides alongside a script that is spread far too thin to retain your interest. There are some good ideas to be found here, but it’s all spoilt by the lack of meat on the bone and not enough seasoning.